This recipe comes from one of my favorite blogs, 101 Cookbooks. I made a few changes, of course (I guess I just can’t leave well enough alone, ever) — not the least of which is the addition to meat to a version of this recipe. The original recipe uses tempeh as the protein, but I created a pork version for Mason (even though he, the committed ominvore, liked the tempeh). While the flavor of the glaze is perfect, I found the tempeh to be really dry, especially when reheated. I like this served over a nice whole grain (the last time I made it, I put it over black lentils mixed with chopped kale — mmm), and I wanted more sauce to soak into the lentils, rice, etc. So, I doubled the sauce ingredients, lengthened the cooking time slightly, and voila! 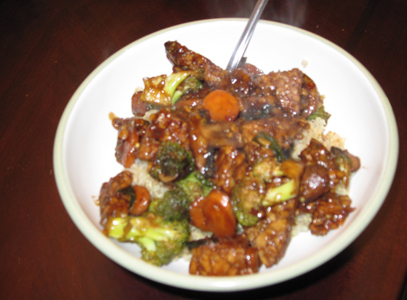 Delicious pork/tempeh with enough sauce to coat the grains. Even with the slightly longer cooking time, this is still a great weeknight meal, as it comes together quickly. Both versions are below. Put the orange juice in a bowl. Squeeze the grated ginger over the bowl to extract the juices, then discard the pulp. Add the tamari, mirin, maple syrup, coriander, and garlic. Mix together and set aside. Cut the tempeh into bite-sized pieces. Heat the olive oil in a large frying pan over medium-high heat. When the oil is hot but not smoking, add the tempeh and fry for 5 minutes, or until golden underneath. Turn and cook the other side for another 5 minutes, or until golden. Pour the orange juice mixture into the pan and simmer for 15 minutes, or until the sauce has reduced somewhat to a glaze. It will have the consistency of slightly runny maple syrup. Turn the tempeh once more during this time and spoon the sauce over the tofu from time to time. 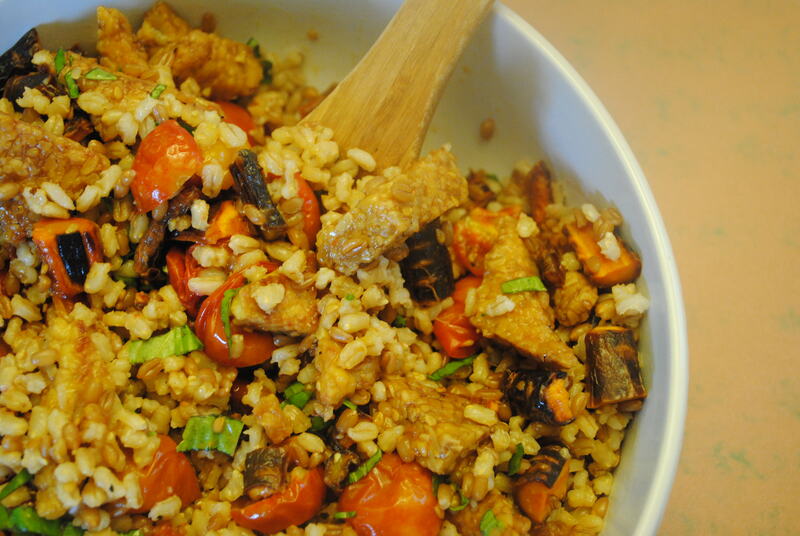 Serve the tempeh over your favorite whole grain, drizzled with any remaining sauce and a squeeze of lime. Sprinkle with chopped cilantro. Heat the olive oil in a large frying pan over medium-high heat. Season pork with salt and pepper. Add to pan and cook about 10 minutes, stirring occasionally, until browned and most of the juices have evaporated. Pour the orange juice mixture into the pan and simmer for 15 minutes, stirring occasionally, or until the sauce has reduced somewhat to a glaze. It will have the consistency of slightly runny maple syrup. Serve over your favorite whole grain, drizzled with any remaining sauce and a squeeze of lime. Sprinkle with chopped cilantro. I want to talk about tempeh for a minute. As meat substitutes go, I place it far above tofu. Don’t get me wrong, tofu is fine, but it takes some work to prepare and it’s difficult to get the texture right. Tempeh has a nutty, slightly soft texture, cooks up quickly, and absorbs flavors readily. I’ve also found that people who are hesitant about meat substitutes like it better than tofu. It’s best if you marinate tempeh for about 20-30 minutes before you cook with it, but besides cutting it into pieces, that’s it for prep work. I had some mushrooms in the fridge from last week’s Greenling box, and when I spotted carrots, green onions, and broccoli in this week’s box I knew I wanted to combine them all in a stir-fry. This one is salty and slightly sweet, and coated with a rich sauce that doesn’t need cornstarch to thicken. In fact, it’s really salty, so if you want to temper the sodium a bit, use low-sodium soy sauce instead of the tamari in the marinade. I served over quinoa. Dice tempeh into 1/2 in. squares or small, thin triangles. Combine tempeh with tamari, vinegar, sesame oil, and hoisin sauce in a zip-lock bag and marinate in the fridge for 20-30 minutes. Combine soy sauce, black bean sauce, and minced ginger. Have this sauce and your veggies ready to go, as stir-fries cook quickly. Heat peanut or canola oil over high heat. When oil starts to sizzle, swirl pan to coat evenly. Add carrots and cook 1 minute, stirring constantly. Add broccoli, mushrooms, and green onions and cook 2 minutes. Add tempeh (including marinade) and soy sauce mixture. Reduce heat to medium high and cook 3-5 more minutes, stirring frequently, until tempeh is heated through and sauce is thick.